I understand how important it is to keep your watercraft in topnotch working condition and looking great. Al’s Professional Fiberglass Boat Repair offers a full line of services that are designed to keep your boat in the best shape possible. I offer free estimates to offer clients the ability to get the best deal for their money, as well as for insurance purposes. Boat Storage Indoor/Outdoor – Safely store your boat at Al’s. Space is limited so call today to make your reservation. Custom Color Matching – Complete paint restoration, match or repair any factory custom paint or graphics, custom match any color, or design complete custom graphics. Structural Fiberglass Repairs Major and Minor – Dedicated and Experienced in all repair techniques necessary to make any structural fiberglass and aluminum watercraft repairs that will stand the test of time. If your boat has experienced any damage, contact us for a free estimate. Transom Repair & Stringer Replacement – The transom, floor, and stringers in a boat are vital elements of its construction; compromising even a single one of the three puts the safety of the vessel and the lives aboard in jeopardy. When you are in need of transom repair and stringer replacement and you want it done right the first time, call Al’s Professional Fiberglass Boat Repair. Scratch and Chip Repair – No matter how careful we try to be with our boats, they often develop scratches and chips. If your boat has these issues, contact Al’s Professional Fiberglass Boat Repair. We can repair any scratches and chips using our color match technique and make the blemishes disappear. 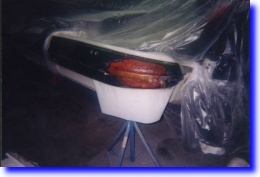 Refinishing and Gel Coat Repair – During this process we remove the top layer of deteriorated gel coat and refinish it using a specialized technique. If your gel coat is in need of refinishing or repair, contact us today to obtain a free estimate. Buffing and Waxing – Waxing your boat’s gel coat is a task that should be done every year to help ensure that your boat retains its luster. If this is too big of a project for you to undertake on your own, contact us to today to schedule an appointment. We will be more than happy to make your boat look as great as it did the first day you got it. Trailer Wood Replacement – If you’re having trouble getting your boat to sit straight on the trailer, it may be time to have your trailer wood inspected and replaced. We are experienced in this process and can help ensure that your boat will remain safe while on your trailer. 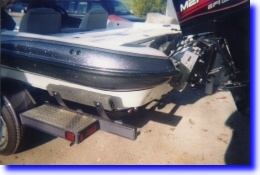 Vinyl Striping and Decal Replacement – As boats are exposed to the elements damage to the vinyl stripping and decals may occur. If this is this case, we can help bring back your vinyl striping and decals to the condition they were in when you first purchased your boat. Aluminum Boat Repair – Aluminum boat repair is also something we tackle. We don’t get into the heavy damage but we do minor scratches, dents and paint work. If you have a question about aluminum boat repair and what we will do give us a call. Contact us to find out how we can help with your boat repair and service needs at 262-472-9290. All Estimates Are Always FREE!